Release Notes is our monthly update that highlights the recent product improvements we’ve made, so you can easily stay up to date on what’s new. Here’s what we launched in April. Let’s say you want to merge few PDF files and then rotate some of the pages, and compress the PDF file at the end. Before you’d have to download the result from one task and re-upload it to the next. We’re trying to make workflows as smooth as possible, so we’ve connected the result from our task to the next. Before you would have to first save the file to Dropbox, then go in your Dropbox and rename it. We’ve simplified this, now you can rename your file right from the results page. Small things make a big difference. If you’re doing the same task twice, and you’ve configured your output filename patterns for the first task, most likely you’ll want to do the same second time as well. We’re making things easier, remembering your settings so second time you don’t have to re-configure them. When merging multiple files and reordering their pages it’s helpful sometimes to re-arrange multiple pages at once. That’s now simple: select multiple pages and then drag and drop them all at once to the new location. Deleting pages is now more intuitive: a handy delete button reveals itself when you hover on the page thumbnails. If you’ve got multiple pages selected, it will ask you if you want to remove them all. We’ve tweaked the design to better suite smaller monitors and optimise for larger area for page thumbnails. We’ve added a new task to our portfolio: cropping PDF files. Easily trim PDF margins, change PDF page size. We’ve very happy to announce we’re improving our product with a new feature: editing PDF files online. With our Online PDF Editor you can add text to an existing PDF file, add images, insert new pages or delete existing ones and highlight text. It’s as usual free to edit PDF files within the free user’s limits that apply to the rest of the website. Give it a try: Edit PDF files online. We’d love your feedback in the comments below. Sejda is a great tool for working with PDFs. Give it a try today. We’ve quietly released a PDF to Word converter, currently in beta. Our conversion algorithm focuses on PDF text document, optimising for legibility when creating the output Word document. This means that some complex layouts that look great in the original PDF will not be preserved in the .doc. Text formatting and paragraphs, on the other hand, will be analysed and we’ll focus on preserving them. Repetitive headers and footers like “Page 1″, “Page 2″ or “Title here - Chapter one”, “Title here - Chapter two” will be removed. Images are also preserved, and we do our best to place them in the correct text context. Use-cases with good results for the PDF to DOC converter are scientific papers with or without double column layouts, web articles, books. Task is currently in beta, so expect some documents to crash or return poor results. If you find this feature useful we’d love to hear more about what works well for you and what needs more improvement. Howdy Sejda Fans, we have some great news to share. 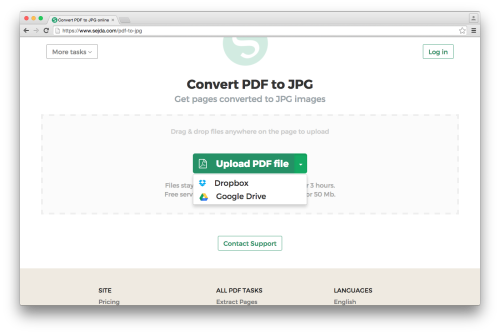 We’ve added a new task that reduces the size of PDF files. We’ve all been there: the PDF scans, the print-to-pdf document, the media brochure, the CV that needs emailing. Sometimes PDF files are too large. Our compression algorithm reduces the size of images to 144 DPI - which should be fine for web and emailing. On top of that, the resources in the document are optimised so all that are unused are discarded. We added a new conversion to the Sejda web application: convert PDF to JPG . Given a PDF document, it converts each page to a high quality jpg image. Simple and straight forward! As usual, feedback is welcome! 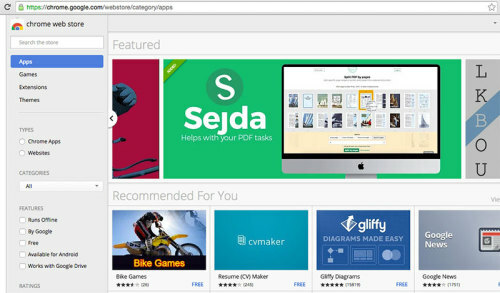 Let’s make Sejda the best PDF manipulation app out there!